Tis the season for croquettes! Perhaps you never noticed that these breaded and fried bundles of minced or mashed food, bound with egg or thick sauce, were utterly cross-cultural. 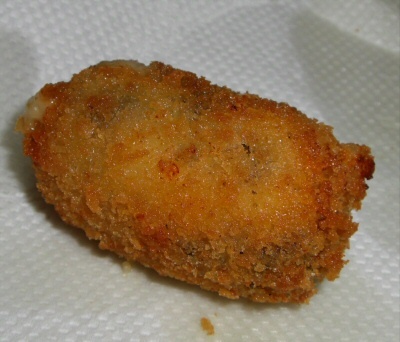 Though invented by the French, who lend transliterated variations of the term "croquette" to Dutch ("kroket") and Spanish ("croqeta"), they hail from a number of other countries/traditions, including Philipino, American Southern, and NY Jewish -- or so we surmise from this topic on salmon croquettes. They can be filled with anything from vegetables to ham to salmon, so dietary constraints aren't an issue. Finally, since we're hitting holidays (and the holiday party season), they make for great seasonal appetizers when the crowds arrive. As always, we're raising a pretty big tent here at the eG Cook-Off. 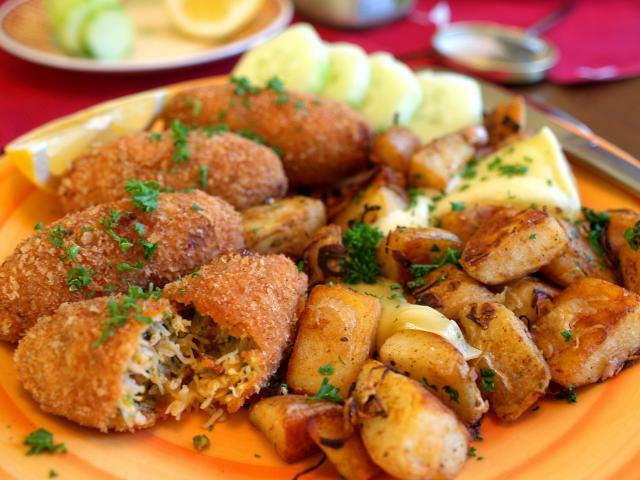 As far as we're concerned, New England cod cakes and German "Meat Cakes" both qualify. Our quick snoop through the recipes suggest that two different binding agents -- a thick white sauce on the one hand, or potatoes on the other -- dominate, but we're eager to learn more. So what are you molding, breading, and frying? I love my crab & chorizo croquettas! To me there has to be as little binding agent as possible - just enough to keep the shape, anymore would be diluting the main ingredients. That's why i always use plain thick white sauce then chill the mixture down. Once it's chilled i use metal spoons to make quenelles, then flour, egg, panko and repeat. Well, the gauntlet has been thrown. Prawncrackers, that's a recipe that I need in Recipe Gullet! I'm always looking for new ways to use chorizo. And not to be forgetting about the Japanese korokke. I seem to be deep-frying challenged (I think some corner of my tightwad soul can't get over the "wasting all that oil" concept ). I also seem to be maintaining a lousy record of following though with any of these cook-offs in terms of actually, like, cooking something as opposed to just kibitzing. But it occurs to me that my Mr. E might really get into some croquettes--it has all his favorite food groups! So maybe I'll be inspired to give him a real treat sometime soonish. I seem to be deep-frying challenged (I think some corner of my tightwad soul can't get over the "wasting all that oil" concept ). I think the salmon patties (salmon from a can, served with creamed peas) that I grew up on at my grandmother's table qualify as croquettes, and they aren't deep fried, nor do I believe that most crab cakes are deep fried, so I'd think you'd be safe in shallow frying without much oil. Bah! It's the holiday season... three gallons of peanut oil set me back almost $30 yesterday. Ouch. But so worth it. We actually eat chicken croquettes (or Chicken crockies as we generally refer to them ) a lot this time of year because I am too busy to cook most weekdays. You can make them ahead (including deep frying) and freeze them, then reheat them in the oven. Whip up some mashed potatoes and voila! instant weeknight "frozen dinner." What recipe/method do you use, Chris? I make a thick veloute (use twice as much roux as normal), process the chicken to a very fine mince (that's the way my wife likes it...) and add it in, add some sauteed aromatics (usually just onions and celery, but sometimes peppers as well), chill overnight, form small balls (approx. 1/8 cup), bread, fry, freeze. Not much of a recipe, I know, but it's easy . I'm looking forward to this cook-off so I can pick up some new tricks. I teach cooking classes -- mostly cocktail party menus. For some reason, when I wrote up the menu a couple of months ago for an upcoming class, I added "smoked chicken and green chile croquettes," never having made a croquette before in my life. Thanks to Google, I found some recipes to start with and came up with a pretty decent recipe. I'm still tweaking it (I'll post it when I have a final), but I'm satisfied with the basics. Like Chris, I'm using a very thick bechamel as the binding agent, with onion, minced roasted green chiles, a little Monterey Jack cheese, chicken and spices. One thing I'm having a little trouble with is getting them to set up -- they're tending to get a little squished during the cooking process. Is that just that I'm not letting them chill enough? I just commented to my wife how I'm happy this thread was started, hoping I can pick up some recipes. She looked at me and said, "You of all people... croquettes are just diner food." I'm speechless. C'mon guys, prove her wrong. i mean, the possibilities are endless, aren't they? and what's not to like about something deep-fried? When I saw this topic, I shuddered. About 35 years ago I worked in a restaurant that had everything but the kitchen sink on the menu. One of the items was turkey croquettes that were made from the meat that was taken off the bones after boiling turkey carcasses. The stuff was truly obnoxious. My grandmother occasionally made chicken croquettes with a blan "white sauce". I wasn't fond of them either so you can understand my antipathy toward croquettes. All that said, I might be inspired to try something like the smoked chicken with green chile or the crab & chorizo ones. I'd like to try some using the white sauce method. I can't use meat -- any good ideas for a vegetable version? 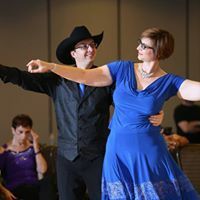 Pam, I think mushroom croquettes would be great -- finely diced sauteed mushrooms, roasted garlic, maybe a little brie or havarti or fontina cheese. DING! That's a great idea, a nice blob of melty cheese in the centre - fontina or tallegio. 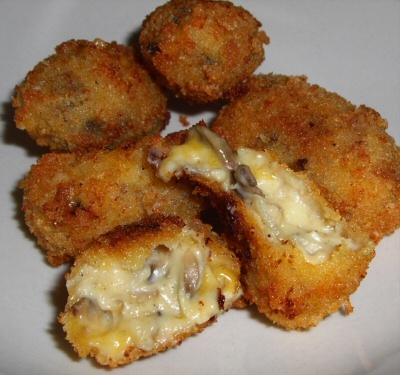 I am so doing that next time i make croquettes. Janet - sounds great. Really great. Need to get some panko . .
Now that Maine shrimp are in season, I'm starting to think along those lines. Ideas? So I think I'm changing tacks here, given that I devoured the Maine shrimp I got but chose not to do the same to the salt cod. Now it's soaked and poached, and I'm thinking about bolinhos de bacalhau. What sorts of sides and sauces should I serve? No clue as to what sides would typically be served, but I'm always a fan of salad. Any kind. A pot of black beans? For for sauces, what about a chimicurra (sp?) and a limey mayo or aioli? Oh, and these just seem to scream for cold beer. As for vegetable or vegetarian croquettes, I had some excellent bean croqs, and sweet potato croqs at at Brazilian restaurant. Lighter than air, with a thin and crisp exterior. I dont recall the proper name for them, but I'm sure somebody out there can enlighten us. For a sauce, pals who've traveled extensively in Brazil confirm what Margarette de Andrade (in her Brazilian Cookery: Traditional and Modern) seems to suggest: molho de ovos, sort of an aioli, though it's a bit unclear. First attempt went well. I made a thick white sauce. In fact, it was so thick I was concerned I overdid it. In a separate pan, I cooked some chopped onion and sliced mushrooms, then added the sauce to it. Cooled briefly then stirred in some diced aged cheddar. It was pretty solid after chilling. They tasted SO good. Very rich though. No photos, but I made those Bolinhos de Bacalhau tonight, with the molho de ovos on the side. (I used smoked paprika and thyme instead of just the parsley.) Very tasty little bites that would have benefited from a cold pilsner -- though the caipirinhas were sufficiently refreshing. just curious to see if these taro dumplings on the top right would count as croquettes? they are one of my favorite dim sum dishes...mashed taro with meat and mushroom filling with this crazy lacy exterior. Dunno if it counts, but you go. Those are fantastic examples of the basic croquette method, methinks.